Hemming is my absolute least favourite part of sewing clothes. I get the impression that most people don’t mind it too much because they can do something else at the same time, but not me. I have to concentrate carefully on my stitching and even then my hems are never invisible. And that’s not even thinking about the annoying process of pinning them up and trying to get them roughly level. I’ve tried machine blind hems and they’re great when you have an underlining to hem onto, but I can’t usually get them to vanish when I’m hemming fashion fabric to itself. The machine stitching is even more obvious than my hand sewn hems. When I was making my Vivienne Westwood skirt knockoff I noticed that the original had the fashion fabric hemmed onto the lining, so that the lining didn’t hang free. I thought this was a great idea – has the same effect as hemming onto underlining and avoids having to hem the lining! It worked pretty well but the lining tends to bag a bit above the fashion fabric on my skirt which is annoying. 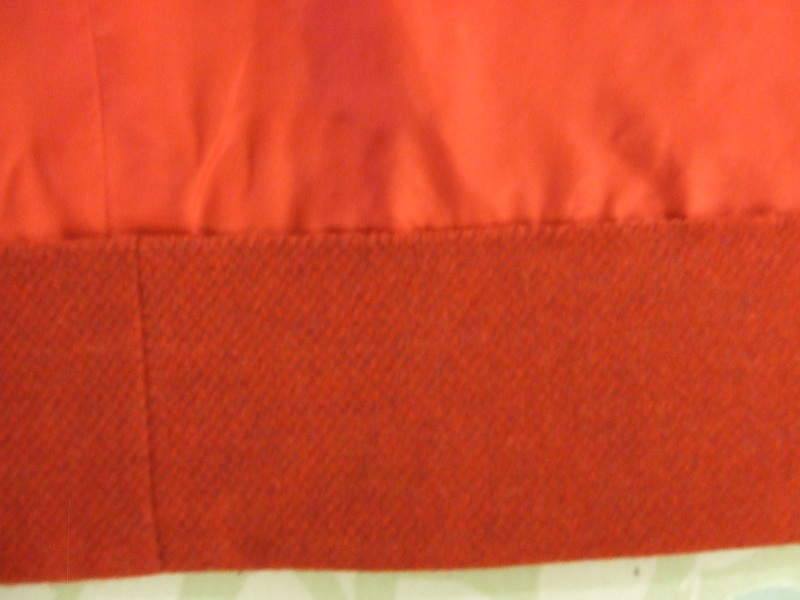 I’ve just finished a Burda skirt in red wool (pictures to follow I hope) and as this was lined I had another go at that method of finishing the hem. Here’s the inside. It doesn’t look beautiful but it’s OK. I deliberately sewed through the lining and caught the odd thread from the outer fashion fabric because I want the hem to keep its shape and the wool hides stitches brilliantly. I have wondered if my visible hems are because I pull the stitches too tight, but I left these ones really loose and you can still somehow see the line of the hem on the outside even though the individual stitches don’t show when you look for them. It’s all a bit of a mystery to me. My sewing books haven’t been much help. I’m just hoping my hems will eventually improve with practice! Posted on October 31, 2010 October 30, 2010 by catherinedaze	This entry was posted in dressmaking, sewing and tagged dressmaking, sewing. Bookmark the permalink. Let me know if you find out the secret to hemming as I too have this problem! I don’t think you can ever get an actual invisible hem. There will always be some show-through. Like you said, pulling the stitches too tight can cause the problem to be worse and it can potentially pucker the fabric. 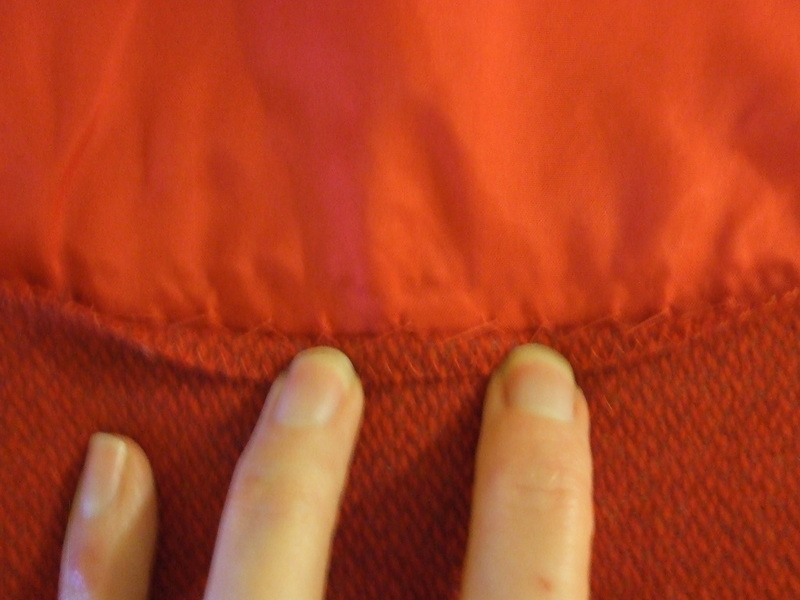 I would definitely attach my hem stitches to the lining (and not the outer fabric) if my garment was lined. If it’s not lined then tiny, even-spaced stitches look better than irregular sized and spaced stitches. The only thing that will help that is practice!